This year is the 5th annual Montana Owners.Com (MOC) Memorial Day Weekend Rally at Lake Siskiyou near the town of Mount Shasta California. 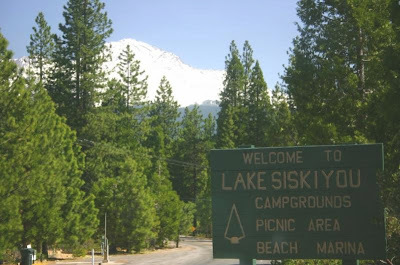 The town and Lake Siskiyou are at about 4,000 feet on the slope of Mt Shasta. We have a total of 33 Montana trailers, 66 people and I would guess about 25 – 30 dogs in attendance. We are all located in the same loop of the campground, but there are other people here as well that no doubt feel over run by Montana Owners. These Rallies are a chance to reunite with friends that we saw while in Quartzsite and to meet in real time friends that we have just written to over the Internet in the Montana Owners Forum. Although the “Official” start of the rally is Friday evening at 6 PM, about a third of the group arrived on Wednesday (including us), another third arrived on Thursday and the final third have been coming in throughout the day. I would have loved to get pictures off all of the trailers together, but there are just too many trees to get more than a couple trailers at a time. One of the many advantages to being retired and fulltimer RVers is that we can arrive 3 days before and leave 3 days after a 3 day weekend. As you can imagine this really reduces the amount of traffic we have to deal with during these long weekends. Another great advantage is you visit places during the week when they are less busy and people have time to just chat. This afternoon we had one of those special encounters. As anyone who has read our blog for very long knows we collect Microbrews, we seek them out as we travel to try the local beers. Today we visited the Mt. Shasta Brewing Company in the town of Weed California. 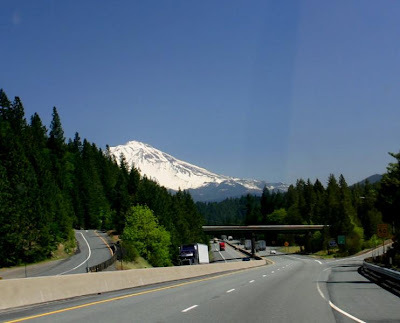 Weed is about 10 miles from Lake Siskiyou and is named after Abner Weed who opened one of the first lumber mills in 1897 and then built a railroad to his mill. I know this being California, you may have thought it was named after a different kind of weed. While visiting the Mt. Shasta Brewing Company, Kathy struck a conversation with a lady sitting near us and the only other person at the tasting room at the time and we found out that she (Barbara) and her husband are the owners and founders of the Mt. Shasta Brewing Company. She gave us a firsthand account of how they converted an abandoned Creamery, a hazards waste site, in to an award winning microbrew. Barbara went on to tell us how they had a Federal case filed against them for producing Weed Amber Ale and putting bottle caps on it that said “Buy Legal Weed”. The Amber Ale is named after the town founder Abner Weed. Barbara and her husband did win the case, but it is a unique experience for any new startup business to be taken to Federal court. Barbara was a neat lady! They didn't know a thing about making beer when they bought the Old Creamery! Fortunately, you can hire a Brew Master and she lets her husband check "Quality Control"! 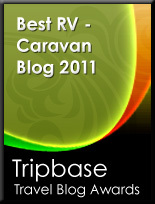 :) We told her we were on a reconnaissance trip to check out "things to do and see in the area" for our RV Club. Her eyes lit up and said, "Do call before you come so that we have enough staff! But yes, we have plenty of room!!" While enjoying the sampler of their brews, you can enjoy watching the brewery in action! They were doing something with the hops when we were there! All of a sudden there was this hoppy aroma! We both love hoppy beers, so it wasn't an unpleasant fragrance! 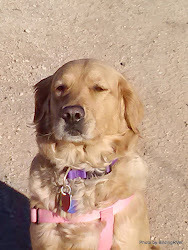 I had told her we were a group of 33 Montana Fifth Wheel Owners, staying down at Lake Siskiyou. Explaining that we were on a "Progressive Rally" up to Oregon, checking out local areas. Funny thing is, she was envious of us! She said, "Man, if we could sell this place, that's the first thing I would want to do, go off in our RV and travel!!" I had to laugh! One of Grant's dreams for an alternate career opportunity 20 years ago was to open the "Coyote Creek Brewery" near IBM in San Jose! But then IBM closed their plant and that was end of that idea! On our way back to camp, it made me really enjoy this life style! We've gone to several places on the off hours and you can really kibbutz with the proprietors and get to know people that do something entirely different than our life style in our "work lives". From the bus driver on our trip from Skagway to the Yukon, who memorized everybody's name, quoted Robert Service and did standup comedy, too! He really was trying to get a job ON the ships! Or the lady in Nevada that told us about her life in Alaska as a gold miner! This little bitty lady, half of my size, could drive a big earth mover?! Every day is an adventure! interesting............there are those micro deals up here......so I guess I know where to find you when you get to this area! If you want to drink beer made from wheat go ahead, we prefer barley. Yes, you do have an exciting lifestyle and NO YARDWORK, which sounds really good this time of year!!! Hope you're feeling well Kathy! I'll be looking at these several more times this weekend. You guys are professional photographers!! Just was wondering while in Weed did you happen to look up any of your cousins? We have cousins still living in Weed!!!! I have not had contact with any of them for over 30 years. Oh, what fun! Beautiful area...would love to do that sometime, but I'm afraid my inflatable mattress is all the camping gear I possess, lol.